Modern, contemporary, traditional, industrial, classic etc. interior design styles helps to revamp your space interior. If you are looking for renovating an interior design style for you space but confused in selecting the best interior style, then consult with the interior designer. Interior Designer knows perfectly which design style is suite for specific interior space. Interior Design styles transform your spaces into more beautiful, lavish and inviting space. 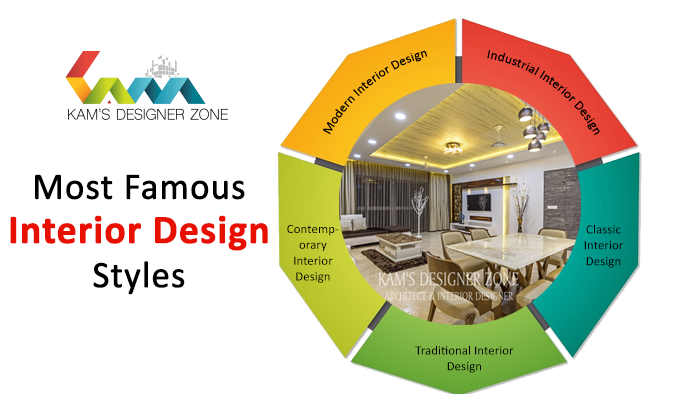 Kams Designer is one of the best Interior Designer in Kharadi, Pune offers wide range of Interior Designs for clients to create perfect interior styles for theirs spaces. Here we listed some interior design styles mostly preferred by the clients. Modern Interior Design style creates sense of simplicity in every interior element, including furniture. It is broad interior design terms mostly include the material likes metal, glass and steel. In modern interior design not a lot of accessories used to design interior space. Contemporary interior style mainly focuses on color, space and shape to create sleek and fresh spaces. A contemporary interior style of designing is defined by simplicity, subtle sophistication, deliberate use of texture, and clean lines. Traditional interior style includes lot of accessories, rich color palettes, variety of texture and curved lines. In traditional interior mostly fabrics like velvet, silk with variety of patterns and textures are used. Traditional interior design offers classic details, splendid furnishing and lot of clutters. Classic interior design has its own importance and is one which never goes out of style. House design by classic interior style attracting by their tranquil colors, atmosphere of reliability and imperial majesty. Industrial Interior Design is one of the famous types of interior design. Its showcases neutral tones, utilitarian objects, and wood and metal surfaces. Industrial Interior style creates a unique and bold design statement with lighting, decor, and furniture.